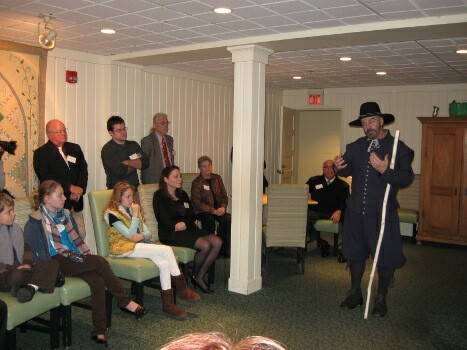 In 2006, the Indiana Society of Mayflower Descendants contracted living history performer Kevin Stonerock to research, write and perform a first-person living history characterization of a Pilgrim. Stephen Hopkins was one of the original passengers who traveled to Plymouth aboard the Mayflower. Set in the late 1620's, Stonerock, as Hopkins, recounts his experiences prior to leaving England, reasons for leaving, the arduous Atlantic crossing, landing on the shores of Cape Cod, their ultimate settlement in what came to be known as Plymouth and the events that followed, including that first winter and some of their encounters with the Native peoples. The program's objective is to give the audience a truer appreciation for the obstacles that were faced and overcome and to debunk some of the commonly accepted myths which have come to be associated with those amazing people we know as Pilgrims. The Indiana Society of Mayflower Descendants offers a limited number of grants each year to Indiana schools in order to partially fund this program. For more information please visit www.kevinstonerock.com.